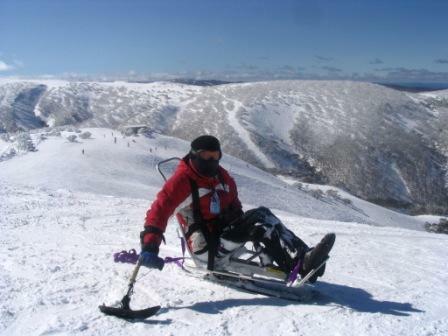 WINTER ADAPTIVE EQUIPMENT FOR DISABLED PERSONS June - end of September. Members of the AMG get free access to Adaptive Equipment and affordable accommodation at Norton House as well as half price lift and ski lesson with Mt Hotham Skiing Company. This also applies to a buddy, guide or volunteer. For Resort services contact, Phil Knight on 0412 270 764. To book a lift tickets, instrucotrs and equipment, please contact the Mt Hotham Skiing Company on (03) 5759 4450 or Email: snowsports@hotham.com.au cc: andrew.watts@hotham.com.au. AMG members get half price lift and lesson and guides get half price tickets when guiding an AMG member. Mono-Ski: A piece of sit down ski equipment, with one ski and using two hand-held outriggers. Designed to be skied independently. People with these disabilities might mono-ski: brain trauma, double amputee, post-polio, muscular dystrophy, cerebral palsy, spinal cord injury, multiple sclerosis, spina bifida. Bi-Ski or Mountain Man: A sit ski with a moulded bucket seat and two skis that can be skied independently in a similar way to the mono-ski with hand-held outriggers, or it can be skied with the assistance of an instructor using stabilising outriggers and tethers. People with these disabilities might bi-ski: quadriplegia, cerebral palsy, multiple sclerosis, muscular dystrophy, amputees, spinal cord injury, severe epilepsy, spina bifida, severe balance impairment. 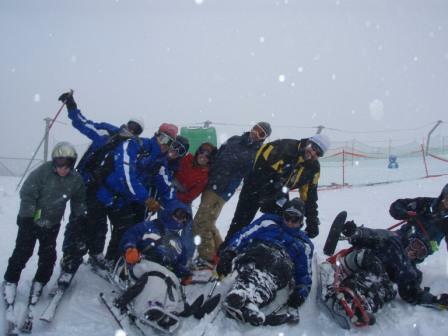 Snowboarding: For those with a variety of disabilities who can stand up will be able to enjoy snowboarding with a buddy. The SnowSlider & Snow Wing: Helps people who can stand enjoy skiing with some assistance. The Snowslider is designed for people with cerebral palsy, amputations, MS, acquired brain injuries, vision impared, one side weakness etc. Visually Impaired: We use a variety of techniques to teach people who are visually impaired. Our guides are trained to use voice commands and techniques suited to the students needs. To book lift tickets, instructors and equipment, please contact the Mt Hotham Skiing Company on (03) 5759 4450 or Email: snowsports@hotham.com.au and cc: andrew.watts@hotham.com.au. AMG members get half price lift and lesson and guides get half price tickets when guiding an AMG member. AMG and the Junior Wheelchair Sports Victoria Camp - All Mountain Rodeo!